He wanted to see the world – but not quite like this … A tall story from Carnegie Medal-winning Frank Cottrell Boyce. 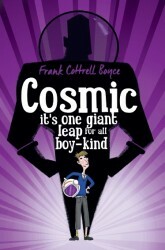 It’s one giant leap for all boy-kind in Frank Cottrell Boyce’s out-of-this-world story: Cosmic. Liam is too big for his boots. And his football strip. And his school blazer. But being super-sized height-wise has its advantages: he’s the only eleven-year-old to ever ride the G-force-defying Cosmic rollercoaster – or to be offered the chance to drive a Porsche. Long-legged Liam makes a giant leap for boy-kind by competing with a group of adults for the chance to go into space. Is Liam the best boy for the job? Sometimes being big isn’t all about being a grown-up. Includes bonus material and discussion questions from Frank Cottrell Boyce, now with a brand-new cover look and inside illustrations by Steven Lenton.